Hey gang! How's things? Good I hope. I hope you all kept your vision after the solar eclipse. There wasn't a lot to see here, but now I have an earworm for the rest of the year. I'm going to get listy. Here's what's new. I'm riding out the end of summer. It's actually been pretty good. I've been driving the girl around everywhere, but that's not so bad. We've been busy and I have to say we've had a better summer than some in the past. We're taking it day by day and not making big plans. She seems to be enjoying the season more than usual and I think it's because she's arguing with me less. (I'm knocking on all the wood.) I don't know about you, but I'm less inclined to want to drive someone and their friends to the beach after an hour long argument about nothing. Perhaps she's learning that keeping mama happy is to her own benefit. I went to see Kidnap with a friend. It was fine. Halle Berry is an Oscar winning actress for a reason. She gives great face performance. Unfortunately, having her in Kidnap just highlighted the terribleness of the rest of the movie. There's a lot of overacting. And some of the lines...yeesh. But it was fun to watch her slam her seemingly indestructible Chrysler minivan into just about every surface she encounters. Who knew a minivan could outrun a Mustang GT?! Enjoy this one on Netflix in a couple of months. 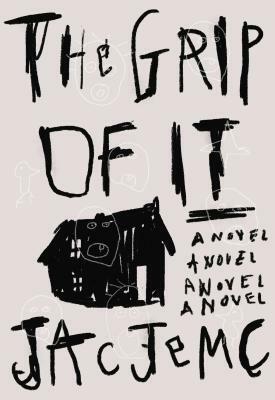 I listened to The Grip of It by Jac Jemc. A Millennial couple moves from the city to a small town to avoid the husband's gambling problem because apparently they've never heard of the online gambling. They purchase a low rent Winchester Mystery House with weird hidden panels and funky vibes. I'm not sure of the reasoning here. "Hey Babe, want to live our own Shirley Jackson fantasy/nightmare?" They work on the fixer upper but not even The Property Brothers can save them from this real estate disaster. First, there are weird noises, items appear and disappear. Then they find themselves waking up in their neighbour's house with no memory of how they got there. Strange drawings appear on the walls and they feel they are losing their grip on reality. I was really into The Grip of It at the beginning, but then I found that the happenings got repetitive. Some of the things that happened seemed pointless and I couldn't understand why this couple kept the things they did from each other. The husband's gambling problem didn't appear to have any real consequences other than moving to a nice little town. Oh the humanity. The ending was hurried and I didn't feel satisfied with how things were wrapped up. There were too many open endings. There are over 1600 unopened messages in my blog gmail account. If you sent me one, I'm probably never going to find it. I'm thinking of just deleting everything in it unread. Sorry. Google informs me that I'm supposed to install a SSL certificate on my blog for user security but since I have a custom domain Blogger won't let me. What a pain in the arse. I don't have the energy to migrate my blog elsewhere. I find the whole thing annoying and it doesn't make me want to hop right back into blogging when I don't really understand what I'm supposed to do. I dunno. Anyone else dealing with this situation? That's about it this week. See you all again soon! I think I'll skip Kidnap and The Grip of It. Glad to know you and your daughter have had a good summer. Kidnap reminded me too much of Taken with Liam Neeson, so I wasn't inclined to watch it anyway. Although seeing a minivan outrun a Mustang may be worth it for the laughs. I'll skip The Grip of It. Sounds...boring. I am glad you are arguing less with the girl. The last few weeks with C at home were not fun. He did not learn that keeping the 'rents happy is a great way to get things you will need at college. Boys. I too couldn't figure out what to do about the SSL certificate thing and have just opted to ignore it. SCREW YOU GOOGLE.